Ed Russo was in downtown Eugene having breakfast with a friend last month when he saw the sign for Defunkify on West Fifth Avenue. “I said, ‘I’ll go check out Defunkify see how they’re doing,’” Russo said. So he walked in, introduced himself and asked how he could help the business. Russo is the new business outreach specialist for the City of Eugene. Previously a business reporter and editor at The Register-Guard, he began working for the city in January, acting as a liaison between businesses and city government. Having reported for many years on Eugene’s economy, Russo is familiar with the business makeup of the city and had covered Defunkify. Defunkify, a laundry detergent powered by enzymes that deep clean performance apparel, was created by University of Oregon scientists and went through the Eugene Regional Accelerator. Defunkify CEO Richard Geiger told Russo he did have some questions regarding access to the business for delivery drivers. He asked Russo for more information about how to keep the back alley open for shipments, as well as parking availability in front of the business for delivery drivers. Russo told him he would look into those issues and provide Geiger some clarification. “I’m just sort of a conduit, a liaison, between his firm and the city to get answers to his questions,” Russo said. Since he started working for the city, Russo has visited other businesses, including Meraki Coffee & Co. on Willamette Street, which opened its doors in February. One of the owners of the café told Russo they’d like to make chalk drawings on the sidewalk outside the shop. 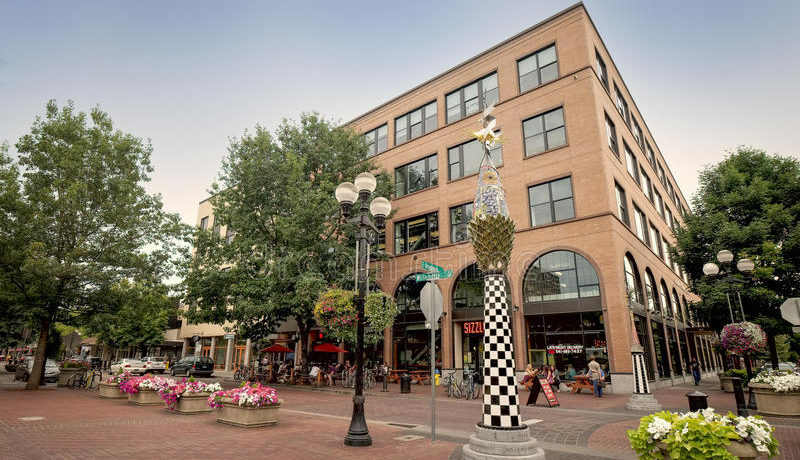 Russo suggested the business consider partnering with Rain Play, an art installation in downtown Eugene that features water-resistant designs by artists that are only visible on the pavement when it rains. He said the reaction from that business owner and others he’s spoken to has been overwhelmingly positive. Russo said he wants to help Eugene’s businesses grow and thrive. He created a one-page flyer with information about some of the city’s main tools that businesses should be aware of. “Because a lot of times business owners don’t know because they’re busy running their businesses and they don’t have time to do all this research on ways the city could help,” he said. The flyer provides details about the city’s four loan programs for businesses and who to contact about questions regarding parking, as well as other information. “If (businesses) have questions about anything the city has responsibility for or has influence over or has a role in I can get the answers they need,” Russo said. Russo reached out to Eugene Regional Accelerator to inform the organization of his new position. He met with Board Chairman Dana Siebert, who encouraged Russo to attend a Startup Coffee Meetup. “I’m very interested in working with the RAIN Eugene folks to make sure that the businesses that they are nurturing know what city services are available to them,” Russo said. Eugene Regional Accelerator Mentor-In-Residence Shane Johnson said he sees Russo as a great resource for early-stage businesses. If you are a business owner who has questions for Ed Russo, contact him at ERusso@eugene-or.gov.